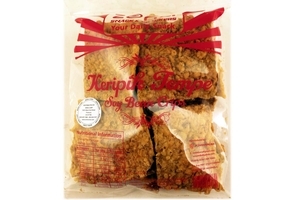 Zonaindo Soybean Crips (Keripik Tempe) in 6.8oz (200g) pack. This soy bean crips is good for snacking. Anytime Anywhere. Product of Indonesia. Halal Certified حلال . Consumed by: Brunei, Burma (Myanmar), Cambodia, China, Hong Kong, Indonesia, Macau, Malaysia, Philippines, Singapore, Taiwan..